Alexander Sokurov was born in 1951 in Russia in the village of Podorvikha (Irkutsk district). His father was a military officer, a veteran of World War II. During Sokurov's childhood his family frequently moved from one place to another, thus he first went to school in Poland and graduated in Turkmenia. After graduating from high school in 1968, the future filmmaker entered Gorky University (Department of History). While a student he began working as a staff member for the Gorky television  first as a producer's technical assistant and later as a producer's assistant. During his work at the television station Sokurov obtained wide experience in film and television technology; and, at the age of 19, he made his first television shows as a producer. In the course of 6 years at the Gorky television Sokurov created several films and live TV shows. In 1974 he got his first degree in History from the Gorky University. In 1975 Sokurov entered the Producer's Department at the All-Union Cinematography Institute (VGIK, Moscow) (Documentary Film studio of Alexander Zguridi). As an excellent student of VGIK he was granted the Eisenstein Scholarship. 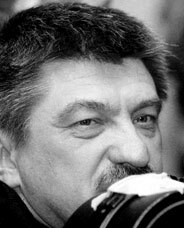 In 1979 Sokurov had to pass external exams and to graduate from VGIK one year early because of his conflict with the administration of the Institute and the leadership of Goskino (State Office of Cinematography): his student works in cinematography were deemed unacceptable, and he was accused of formalism and anti-Soviet views. His first feature film, which later received a number of awards, was The Lonely Voice of a Man, after an original story by the Russian writer Andrey Platonov; it was not accepted as a graduating project. It was at that time that he received support from the outstanding film director Andrey Tarkovsky, who was out of favor with the authorities at that time and very highly appreciated Sokurov's first work. Sokurov's friendship with Tarkovsky did not come to an end even when the latter left Russia. With Tarkovsky's recommendation letter Sokurov was employed by the film studio Lenfilm in 1980, where he worked on his first feature films. At the same time Sokurov worked at the Leningrad Studio for Documentary Films, where he has made all of his documentaries at different times. Even Sokurov's first films in Leningrad caused negative feedback from the communist party leadership of the city and from the Goskino. For a long time (until the period of democratic reforms in the mid-80s) none of his films were approved for public screening by Soviet censors. In the late 80s a number of his early feature and documentary films were released for public performance and represented the Russian film industry at many international festivals. In the 8090s he sometimes made several feature and documentary films in one year. At the same time Sokurov was involved in non-commercial programs for youth on the radio and taught a class in Film Directing for young people at the Lenfilm Studio. In 19981999 he conducted a television show, Ostrov Sokurova (Sokurov's Island) where the issue of the place of cinematography in modern culture was raised. In the mid-90s together with his colleagues Sokurov began to familiarize himself with video technologies. This process continues today. The filmmaker has produced a number of documentary films. Several of them were made in Japan for Japanese TV companies due to the enthusiasm and generosity of Sokurov's Japanese friends. He has been a participant and laureate of many international festivals. Every year his films are shown in various foreign countries. Several times he has received awards from international festivals: the FIPRESSI Award, the Tarkovsky Award, the Russian State Award (1997) and the Vatican Award, Third Millennium (1998). In 1995 the European Film Academy listed Sokurov as being among the best 100 directors of world cinema. At the present moment he is in the process of founding a film studio, Bereg, for non-commercial feature and documentary films. The foundation for this venture is laid by Sokurov's camera crew at Lenfilm. The studio has no governmental or private funding. English translation by Anna Shoulgat.